Guavas are plants in the myrtle family (Myrtaceae) genus Psidium, which contains about 100 species of tropical shrubs and small trees. Native to Mexico and Central America, northern South America. Most likely naturally spreading (by means of ocean drifting) to parts of the Caribbean and some parts of North Africa, guavas are now cultivated and naturalized throughout the tropics, and due to growing demand they are also grown in some subtropical regions. The most frequently-encountered species, and the one often simply referred to as “the guava”, is the Apple Guava (Psidium guajava). Guavas are typical Myrtoideae, with tough dark leaves that are opposite, simple, elliptic to ovate and 5-15 cm long. The flowers are white, with five petals and numerous stamens. The genera Accara and Feijoa (= Acca, Pineapple Guava) were formerly included in Psidium. 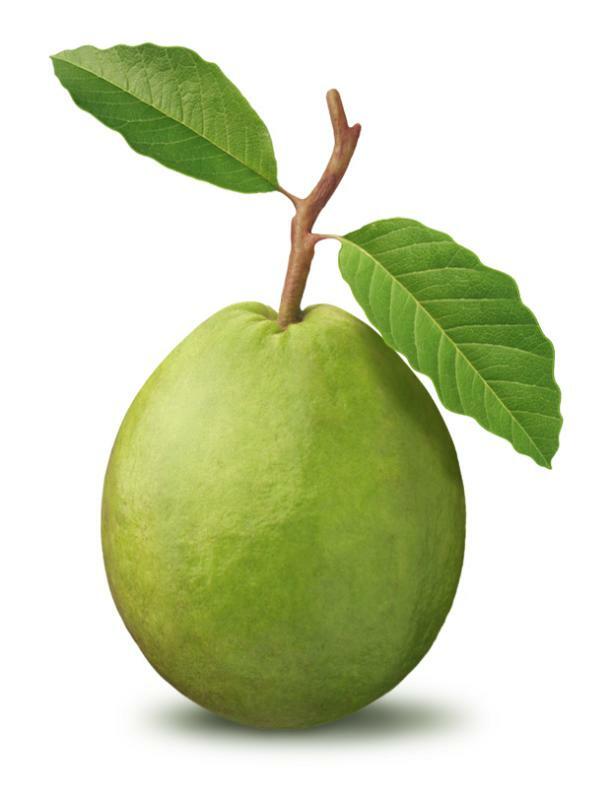 The term “guava” appears to derive from Arawak guayabo “guava tree”, via the Spanish guayaba. It has been adapted in many European languages: guava (Swedish, Danish and Norwegian, also Greek Γκουάβα and Russian Гуава), Guave (Dutch and German), goyave (French), gujawa (Polish), goiaba (Portuguese). Outside of Europe, the Arabic jwafa,the Punjabi “amrud”, the Japanese guaba (グアバ), the Tamil goiyaa, the Tongan kuava and probably also the Tagalog bayabas are ultimately derived from the Arawak term. Another term for guavas is pera or variants thereof. It is common around the western Indian Ocean and probably derives from Portuguese, which means “pear”, or from some language of southern India, though it is so widespread in the region that its origin cannot be clearly discerned anymore. Pera itself is used in Malayalam, Sinhala and Swahili. In Marathi it is peru, in Bengali pearah, and in Dhivehi feyru. In northern India and Southeast Asia, there are some other names for guavas which have a more limited use. These include jaam (used in Farsi, Hindi, Punjabi and Urdu). Jaama is used in Telugu, jaamba (in addition to peru) in Marathi, jambu or jambu batu in Indonesian and Malay, and jhamruk or jaamfal in Gujarati. Note that jambu or jumbu may also refer to Syzygium fruit (rose apples or water apples). The more widespread name for guavas in Northern India is amrood (used in Farsi, Hindi, Punjabi and Urdu as an alternative to jaam), bihi (used in some Central Indian dialects of Hindi), da-bike (Khmer), ổi (Vietnamese, pa̍t-á (Min Nan), peguulli (Oriya), pha-rang (Thai) and seebe kayi (Kannada). In Assam (India), it is known as “Modhuri Aam” in Assamese & the fruit is very popular. Psidium species are used as food plants by the caterpillars of some Lepidoptera, mainly moths like the Ello Sphinx (Erinnyis ello), Eupseudosoma aberrans, Snowy Eupseudosoma (E. involutum) and Hypercompe icasia. Mites like Pronematus pruni and Tydeus munsteri are known to parasitize the Apple Guava (P. guabaya) and perhaps other species. The bacterium Erwinia psidii causes rot diseases of the Apple Guava. The fruit are not only relished by humans, but by many mammals and birds as well. The spread of introduced guavas owes much to this fact, as animals will eat the fruit and disperse the seeds in their droppings. In several tropical regions, including Hawaii, some species (namely Strawberry guava, P. littorale) have become invasive species. On the other hand, several species have become very rare due to habitat destruction and at least one (Jamaican Guava, P. dumetorum), is already extinct. Guava wood is used for meat smoking in Hawaiʻi and is being used at barbecue competitions across the United States. In Cuba the leaves are also used in barbecues, providing a nice smoked flavor and scent to the meat. Guavas are cultivated in many tropical and subtropical countries for their edible fruit. Several species are grown commercially; Apple Guava (P. guajava) and its cultivars are those most commonly traded internationally. Mature trees of most species are fairly cold-hardy and can survive as low as 5 °C (41 °F) for short periods of time, but younger plants will not survive. They are known to survive in Northern Pakistan where they can get down to 5°C or lower during the night. Guavas are also of interest to home growers in temperate areas, being one of the very few tropical fruits that can be grown to fruiting size in pots indoors. Guava fruit, usually 4 to 12 cm long, are round or oval depending on the species. The outer skin may be rough, often with a bitter taste, or soft and sweet. Varying between species, the skin can be any thickness, is usually green before maturity, but becomes yellow, maroon, or green when ripe. Guava fruit generally have a pronounced and typical fragrance, similar to lemon rind but less sharp. Guava pulp may be sweet or sour, off-white to deep pink, with the seeds in the central pulp of variable number and hardness, again depending on species. Guavas in Larkana, PakistanThe fruit is also often prepared as a dessert. In Asia, fresh raw guava is often dipped in preserved prune powder or salt. Because of the skin’s high level of pectin, boiled guava is also extensively used to make candies, preserves, jellies, jams, marmalades (goiabada), and also for juices and aguas frescas. Guava juice is very popular in Mexico, Colombia, Egypt and South Africa. Red guavas can be used as the base of salted products such as sauces, constituting a substitute for tomatoes, especially for those sensitive to the latter’s acidity. In Asia, a tea is made from guava fruits and leaves. Guavas are often marketed as “superfruits”, being rich in vitamins A and C, and if the seeds are eaten too, omega-3 and omega-6 polyunsaturated fatty acids and especially high levels of dietary fiber. A single Apple Guava (P. guajava) fruit contains over four times the amount of vitamin C as a single orange (over 200 mg per 100 g serving) and also has good levels of the dietary minerals, potassium, magnesium, and generally a broad, low-calorie profile of essential nutrients. However, nutritional value is greatly dependent on species, the Strawberry Guava (P. littorale var. cattleianum) notably containing only 30–40 mg of vitamin C per 100g serving, practically a tenth of the vitamin C found in more common varieties. Vitamin C content in the Strawberry Guava is still a high percentage (62%) of the Dietary Reference Intake however. Green apple guavas are less rich in antioxidantsGuavas contain both carotenoids and polyphenols – the major classes of antioxidant pigments –, giving them relatively high dietary antioxidant value among plant foods. As these pigments produce the fruits’ color, guavas that are red or orange in color have more potential value as antioxidants sources than yelllowish-green ones. Since the 1950s, guavas – particularly the leaves – have been a subject for diverse research in chemical identity of their constituents, pharmacological properties and history in folk medicine; most research has been restricted to the Apple Guava (P. guajava) however, and any additional beneficial properties of other species remain essentially unstudied. From preliminary medical research in laboratory models, extracts from Apple Guava leaves or bark are implicated in therapeutic mechanisms against cancer, bacterial infections, inflammation and pain. Essential oils from guava leaves have shown strong anti-cancer activity in vitro. Guava leaves are used in folk medicine as a remedy for diarrhea and, as well as the bark, for their supposed antimicrobial properties and as an astringent. Guava leaves or bark are used in traditional treatments against diabetes. You can Find number of different recipes in Ayesha’s Kitchen. great information on guava. Well written. Guava is humble looking fruit. I find guava very tasty. It is good for health. It is rich in vitamin C. It is great for eyes and heart, skin, hair. It also helps for combating colon and prostate cancer and has many other benefits. Great information on Guava, Ayesha! My favourite fruit. When the summer is over and Guava ripes on the tree, my friends have to find me there in my guava garden. I knew it helps in constipation but never knew about diabetes. In the Philippines,we use Guava water (boiled leaves) to heal all kinds of skin irritations, or infections. Effective and quick remedy for diahria and when we were kids growing up in the mountain with no toothbrush, we used the guava bark fibers to clean our teeth.